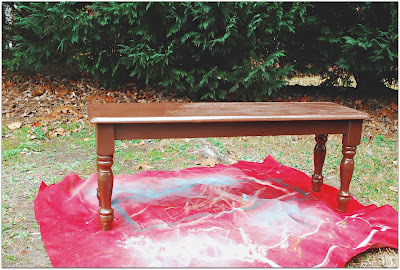 Life as a Thrifter: Bench plus Paint equals Love. Bench plus Paint equals Love. You may or may not remember this little bench we had sitting behind our sofa. I found it at a yard sale for $15 last year. And since I'd been wanting to try out Rustoleum's Chalkboard spray paint for some time now. . . I thought I'd give it a-GO on my bench! I'm happy to report (if you didn't already know), it's fabulous! Surely there's something else around my house I can spray paint with it . . . Linked up to: (Monday) Lines Across My Face, Nifty Thrifty Things, Making the World Cuter, C.R.A.F.T., Serendipity & Spice, Homemaker on a Dime, Everything Under the Moon, Tutus and Tea Parties, (Tuesday) The Girl Creative, Not Just a Housewife , Chef in Training, Sugarbee Crafts, Sassy Sites, It All Started with Paint (Wednesday) Blue Cricket Designs, Domestically Speaking, Clean & Scentsible, Uncommon, The Thrifty Home, Organize & Decorate Everything, JAQS Studio, 733, Southern Lovely , Someday Crafts, Chatty Chicks, (Thursday) Between You and Me, House of Hepworths, Beyond the Picket Fence, Saved By Love Creations, Shabby Creek Cottage, Bacon Time, (Friday) Design Dazzle, Miss Mustard Seed, The Crafty Nest, A Little Inspiration, Tatertots & Jello, Funky Junk Interiors, Primitive & Proper Pin It Now! Dam you..... now I'm singing. hello everything in my house, watch out! Wow this is georgeous !!! Well done. 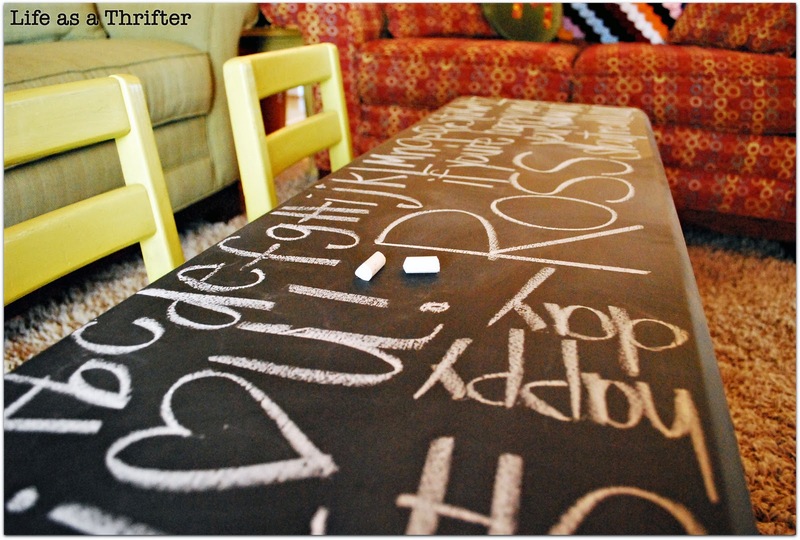 As soon as I saw the thumbnail of the before in my reader I thought, chalkboard paint! We are definitely on the same wavelength! Looks great. What a fun idea, so darling!! Love the little yellow chairs! Saw your link on Serendipity and Spice and LOVE it! I was just actually thinking about doing the same thing to either my kitchen table or my coffee table, because they both look so terrible. I might have to try it! 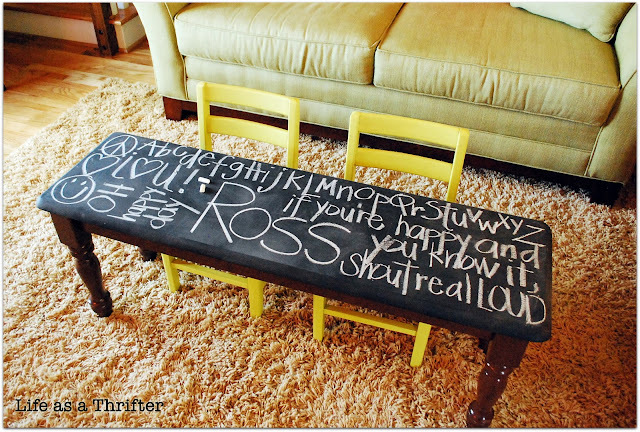 This idea and your blog are so cute! I would LOVE for you to link this up to my link party! Adorable! Absolutely adorable! I gave it a pin. :) Thank you for linking up to A Pinteresting Party. What a fun upcycle! Sharing for Blue Velvet Chair FB friends. It's so perfect with the tiny chairs! I love it. You are such a great photo stylist! i just found your blog from pinterest and i am LOVING all of your projects! definitely a new follower! I have GOT to find something to put this on! :D The bench looks fantastic! Great! I love chalkboard paint! 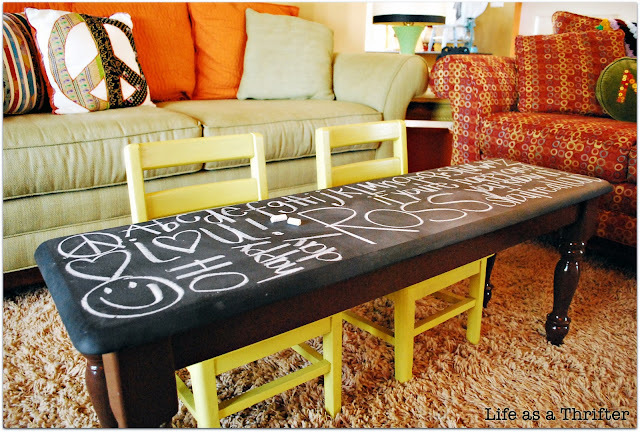 A bench as a kids table + chalkboard paint = perfection! Love it! Please stop by and share with my readers if you get a chance. I actually pinned this days ago and sent a link to my niece with a note that I'm going to make this for her little girls! I have two little chairs that my no-longer-little kids have outgrown. ... would you link this at our "Imagine the Impossibilities" link party too? So glad you came to the party! So glad you linked this up to our Impossibilities Party - I absolutely love it!! Gotta do this.......I love it. My grandkids would love it to. Enjoying your blog. I've just started blogging, so COME VISIT ME!!! This is such a cute project...I might need to make one for my nephew! Love this. It's feature worthy! Great job! I just discovered your blog today and I've enjoyed looking around. I love it! This project is just too cute. Looks great! My girls would just love that! 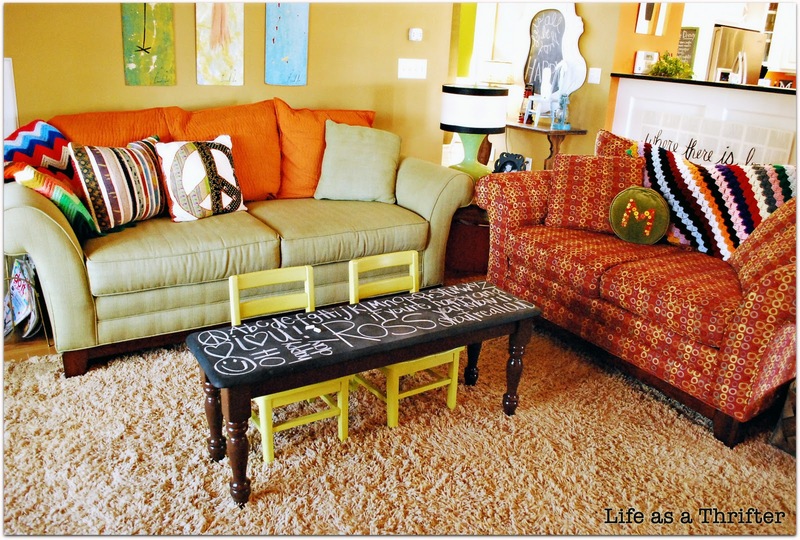 i love that holly- and i think it looks perfect with those brightly colored chairs! how fun! Love it! I wish I had, had one of these when my kids were small. This would of kept them occupied for a long time. Thanks for sharing this wonderful project. I will have to tell my daughter about this. re-doing my coffee table tomorrow...I run a daycare out of my home, won't the kids just love this??? Do you think the spray worked better than the paint?